The following blog post first appeared on VA’s Center for Innovation website. Health is more than an absence of sickness—it’s being able to do the things that make you happy and define who you are. A fisherman who cannot fish due to arm loss. An outdoorsman unable to chop wood from a hand contracture. Or a runner’s inability to run due to heart condition. They’re all far from an optimal state of well-being. But, what if you could design a custom health solution for each one? What if – You could print assistive devices that help make people feel whole again? Right now, the VA Center for Innovation (VACI), in a partnership with Stratasys, one of the largest global manufacturers of 3D printers is making this vision a reality. This VACI-Stratasys team is continuing to build upon VA’s existing work in this arena to help launch the first nationwide medical 3D printing network with support. As part of this effort, five 3D printers provided by Stratasys were installed in VA hospitals across the country – in Seattle, Albuquerque, San Antonio, Boston and Orlando. This effort is building upon the strong work already being conducted in 3D printing at VA, including at the McGuire VA hospital in Richmond, VA.
3D printers create objects from digital designs by laying down extremely thin layers of material one at a time on top of each other, eventually building a three-dimensional object. These printers can create unique parts customized for each Veteran – even reproducing near-exact replicas of body parts. Already, the power of the new Stratasys 3D printers and the connectivity of the network have helped change the lives of Veterans. Brayshaw testing the fit of the prototype 3D printed orthotic with his occupational therapist Mary Matthews-Brownell. Gary Brayshaw, a Veteran in Washington state, is an avid outdoorsman. Chopping wood was a daily occurrence and a way of life before his hand contracture made this impossible. 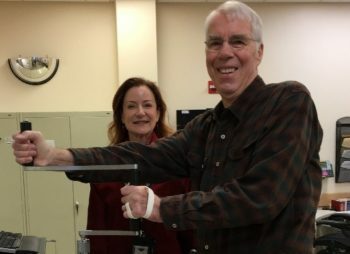 A determined occupational therapy hand specialist, Mary Matthews-Brownell, contacted the Seattle VA 3D printing leadership, and explained her vision for a custom 3D printed splint for her patient. Seattle leadership then identified the ideal network specialist for the project, Ben Salatin, a clinical rehabilitation engineer at the Albuquerque, New Mexico VA hospital. Salatin and Matthews-Brownell worked together to bring her vision to life, a rugged 3D printed custom orthotic enabling Brayshaw to confidently pick up an axe again. Matthews-Brownell’s original hand crafted orthotic was CT scanned in Seattle and the digital file was sent to Ben, who optimized the design and 3D printed a fit test prototype. Brayshaw liked the fit so the final orthotic will be printed from a softer, more rugged material and delivered to him. If the orthotic does break, Brayshaw does not need to come back for a new one to be hand fabricated. A perfect replica orthotic can be 3D printed from the digital design file and mailed to Brayshaw, saving him travel time and allowing Matthews-Brownell to see other Veterans. Veteran Ismael Baca is happy with the performance of his new 3D printed toggle switch (inset). Ismael Baca, a Veteran living in Albuquerque was involved in an incident where she suffered a spinal cord injury. When he visited the Albuquerque VA hospital’s Spinal Cord Injury Center for therapy, Salatin, once again got to work. He noticed that Ismael had difficulty activating the toggle switches on his wheelchair joystick due to his lack of finger function. To find a solution, Salatin designed and 3D printed a press-on adapter to enlarge the toggle switch so Ismael could easily access the controls. After a week of testing, Ismael could use his wheelchair with far greater ease. This toggle design will now be shared with other VA hospitals so other Veterans can take advantage of this solution, too. 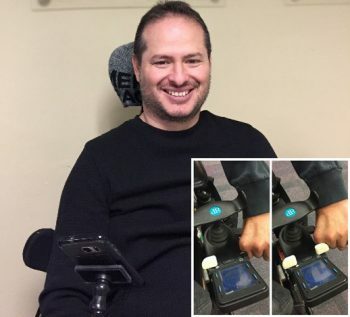 With only a few quick design changes, the wheelchair joystick can be customized to fit the unique needs of any Veteran. Dr. John Hoy, VACI 3D printing network co-lead and associate chief of staff of r adiology at the Orlando VA, has been working with his dedicated team to come up with even more best practices for connecting hospitals across the country so that both physical resources (such as printers) and VA employee expertise are available to all Veterans. By connecting VA medical centers to the right 3D tools and people who know how to use them, more Veterans will access to customized 3D printed body part replicas, assistive technology devices, orthotics, and other tools. The overarching vision for 3D printing is for universal availability at all 168 VA hospitals across the country. Many, many more Veterans will be empowered to do things they love again…just like Brayshaw and Ismael. This work is part of VA Center for Innovation’s VA Innovators Network to help build a culture of innovation embedded at the front lines of VA to allow employees to see and solve opportunities on the front lines to develop the best possible experience for Veterans. Learn learn more about the VA Innovators Network. About the author: Beth Ripley, M.D. Ph.D. is a Puget Sound Veterans Health System Radiologist. I can’t get my VA to feolace my insulin pump. It is out if warranty and if it fails I will have to do without.